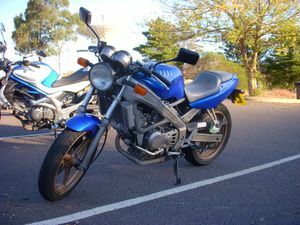 The Honda VT 250F Spada MC20 is a small production motorcycle built between late 1988 and the end of 1989. It was never exported to the US. It is a small V-twin engined sports machine with a displacement of 249 cc. It produces 40 hp (30 kW) and produces a sufficient amount of torque. Weighing in at 139 kg dry the Spada, even though equipped with basic suspension, handles very well. The Spada is mainly recognized by its "CASTEC" cast aluminum frame, this frame is 5 kg lighter and over 30% stiffer than the previous steel version. The Spada is geared to a top speed of just over 160 km/h and does so without any trouble. With its six-speed gearbox and aluminum frame, it was a more advanced and more powerful machine than its successor, the Honda VTR250.